Alia Bhatt celebrated her birthday in Bulgaria, where she is currently filming Brahmastra with Ranbir Kapoor and Mouni Roy. Ranbir Kapoor's mother Neetu Kapoor was also in Bulgaria at the time and shared a few pictures from the cozy get-together, which Brahmastra director Ayan Mukherji had put together for Alia. In one picture shared by Neetu Kapoor, Alia Bhatt appears to be "in her own world," while the other was a group picture with other members of the cast and crew joining Alia and Neetu. Alia's fan clubs also shared photos and videos of the actress cutting the birthday cake, twice. 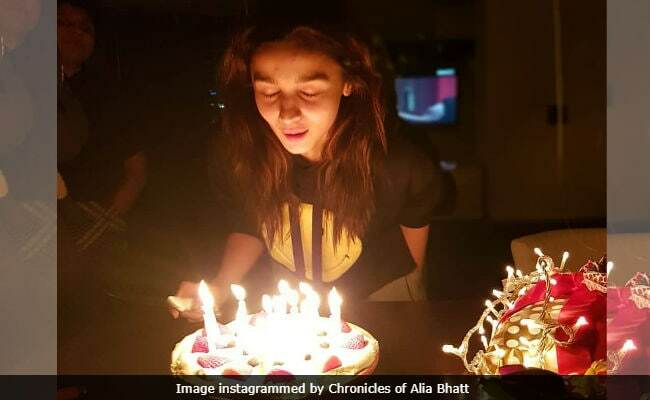 Alia Bhatt celebrated her 25th birthday on March 15, which she started by sharing two new stills from her upcoming film Raazi on Instagram. Later in the day, she instagrammed a video of her one-year-old self, playing with her father Mahesh Bhatt, which BTW the Internet loved. Several Bollywood celebrities including Katrina Kaif, Akshay Kumar, Sonam Kapoor, Sushmita Sen, Shahid Kapoor, Madhuri Dixit and parents Mahesh Bhatt and Soni Razdan had shared fabulous birthday messages for the actress on social media. Alia Bhatt was last seen in Badrinath Ki Dulhania and she is currently awaiting the release of the aforementioned Raazi, which is directed by Meghna Gulzar and it also stars Vicky Kauhal. Alia is currently filming Brahmastra and she will later get busy making Zoya Akhtar's Gully Boy, co-starring Ranveer Singh. Amitabh Bachchan, who is also part of team Brahmastra, has currently assigned his dates for Thugs Of Hondostan and will join the team soon.